As the final whistle blew on Sunday afternoon at Old Trafford, Manchester United had taken sole possession of first place. In a marquee matchup between the first and third place teams, Manchester United thoroughly dominated Chelsea, who was made to pay for their wasteful finishing and sloppy defending. In his first clash with Sir Alex Fergueson, Andre Villas-Boas walked away from the pitch disappointed in a team that could have made a statement as title challengers. Manchester United played well early in the game, but were the beneficiaries of two close decisions from referee Phil Dowd and his linesmen. The first came in the 8th minute when Chris Smalling broke in and headed home a goal from Ashley Young’s set piece, a fine goal despite Smalling appearing to be a half yard offside at the time of service. The goal remained and Manchester United found themselves off to a dream start. Their good fortunes continued as Fernando Torres found his way in on goal thanks to an errant pass by Anderson, but when it came to the finish he pushed the ball wide. A few minutes later, Chelsea found themselves with another chance thanks to nice setup by Juan Mata and Fernando Torres slotted the ball across the goal to Ramires whose first time finish was stopped by an outstretched David De Gea. In an attempt to recreate Wayne Rooney’s iconic bicycle kick goal, Fernando Torres could not find the mark. The match’s next breakthrough happened in the 37th minute, when Jonny Evans’ long ball found Nani who appeared to be returning from offside position. After taking control, Nani calmly dribbled through two Chelsea defenders before delivering a thundering strike past Petr Cech into the back of the net from just outside the box. From that moment forward it looked to be United’s day, as Nani celebrated with somersaults. Chelsea’s misfortunes continued, when just before halftime John Terry’s clearance bounced off of Nani, right to the feet of Wayne Rooney, who calmly finished to give Manchester United a 3-0 first half lead. With all to do in the second half, Andre Villas-Boas brought on Nicolas Anelka at halftime for the largely ineffective Frank Lampard. This substitution had an immediate impact on the game, when Anelka found Fernando Torres with a perfectly placed through ball that the Spaniard was able to chip home for his first goal of the season. A few minutes later, Juan Mata saw his effort push around the post by David De Gea, the ensuing run of play from the corner saw United break out in counter attack and after Nani’s deflected shot hit the bar, he was dragged down in the box by Jose Bosingwa and a penalty was awarded. Wayne Rooney stepped up to take the penalty, but the execution was reminiscent of John Terry’s effort in Moscow during the Champions League final, and the score remained 3-1. Later, Torres weaved his way through United defenders to deliver a shot that was stopped by De Gea, the ball bounced back to Torres who struck a volley, but the ball sailed over the goal to looks of disappointment from manager and players alike. Manchester United was never short of scoring chances Sunday afternoon and Wayne Rooney was on the receiving end of a cross from Ashley Young, his flicked finish hit the post and as Chicharito went for the finish, Ashley Cole met him with a lunging, tackle that earned him a yellow card. Chicharito would have to go off as a result of the tackle which led to post-match complaints from Sir Alex Fergueson. Chelsea was still fighting to get back in the game when Ramires found Fernando Torres with a beautiful through ball that left the Spaniard with only De Gea to beat. After deftly rounding the keeper, Fernando Torres went for the finish, but ended up with one of the most shocking misses of the season as the ball ended up with the fans behind De Gea’s goal. 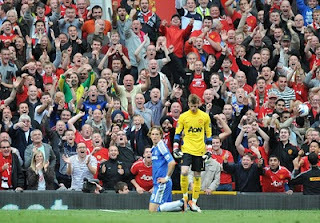 Torres fell to his knees clutching the turf after the miss, shocked that he had been unable to finish, while the jeers of Old Trafford’s faithful washed over the pitch. In the dying embers of the match, Wayne Rooney broke through the Chelsea defense with Dimitar Berbatov to his right. After passing to a wide open Berbatov, with only the wide open goal ahead, last year’s top goalscorer’s weak finish was cleared off the line by Ashley Cole who had hustled back to prevent the goal. The match ended a few moments later, and United garnered sole possession of first place. Manchester United’s early season could seemingly not get any better, winning their first five matches by a combined total of 17 goals. Chelsea remain in third place, three points behind Manchester City (who drew against Fulham), and five points behind Manchester United. 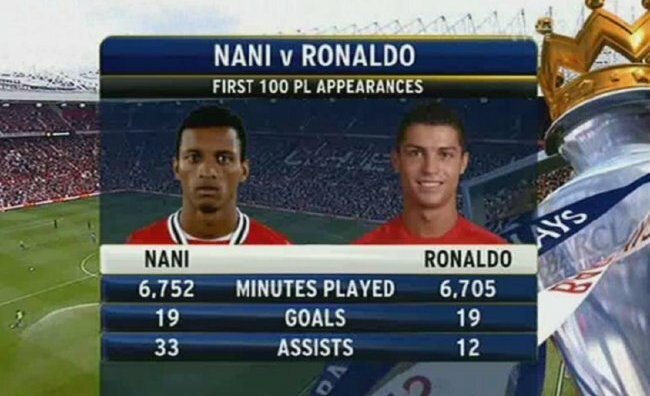 Nani gets the background today for his wondergoal.